How does Eli Yishai's new party affect the Ashkenazi hareidi camp, and will it go left or right? With pre-election unity having been attained, more or less, in the religious-Zionist camp, attention now turns to the hareidi-religious sector – which is now in danger of fielding four different lists in the coming elections. On the Sephardic side of the hareidi public, Shas-breakaway Eli Yishai's new party – Ha'am Itanu, The People are With Us - is expected to compete strongly with Shas. Some polls even predict that Yishai could take half of Shas' Knesset mandates, leaving each with 4-5. The Sephardi split is even threatening to cause a new rift in the Asheknazi camp, which has been semi-divided into two parties ever since 1988. Only in one national election, however – 1988 – did they actually run on two separate lists. Since then, they have always managed to find the key by which to field a joint list: United Torah Judaism, comprising Agudat Israel and Degel HaTorah. 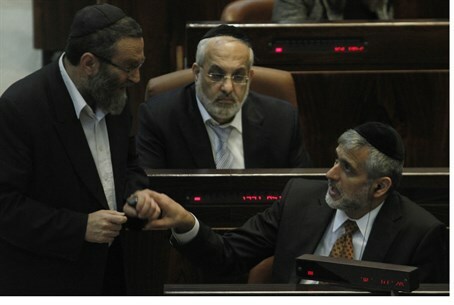 This time, once again, bickering has already begun on the way to hammering out the joint list – and it has much to do with Eli Yishai. A source in Agudat Israel has been quoted as blaming its partner, Degel, for showing tacit support for Yishai's new party. "We are trying to increase our 7 Knesset seats to 8," the source said, "but by warmly embracing Yishai, this is likely to shift right-wing hareidim and others to him, thus hurting us badly at the polls." Another Agudah source blamed Degel from precisely the opposite direction. MK Moshe Gafni, leader of Degel HaTorah, has said publicly that he would join a Herzog-Livni government – and Agudah feels this is simply another way of driving away votes from the joint Ashkenazi hareidi party. "Does he [Gafni] not realize that the Chabad camp, which believes strongly in holding onto the Land of Israel, will simply not vote for us?" asks the Agudah source. "And the same with working hareidim and those who lean to the right-wing. Where is the logic?" The sought-for "logic" can possibly be found in another statement MK Gafni made on the same occasion, speaking to the Knesset TV Channel. He said that he simply does not forgive Naftali Bennett – the head of the Jewish Home religious-Zionist party, a natural Likud partner if Netanyahu forms the next government – for his role in cutting hareidi funding. Some have suggested that Gafni's anger at Bennett is one of his main motivations in his political maneuvering.